The first scene of Atlanta, Donald Glover’s hilarious, magic realist sitcom airing Tuesdays on FX, takes place in an unusual spot for a TV show: a parking lot. This should be a common setting, as most Americans live in the suburbs. But sitcoms about 20-somethings always seem to be set in New York or L.A., depicting low-paid young people who can somehow afford giant apartments and take taxis everywhere. Not Atlanta. The best show on TV right now is about working-class African-Americans in the Southern suburbs, and it highlights one of the country’s biggest, least-appreciated problems: living without a car in the midst of sprawl. Earn, the show’s main character (played by Glover), doesn’t own a car. He works at the airport, one of the few major spots in Atlanta well served by the city’s limited transit system. But getting to the train is another story. Hardly anyone, especially anyone who isn’t affluent, lives right near a train station. So Earn rides the bus to the train, suffering through long, slow rides and walking on streets without sidewalks. 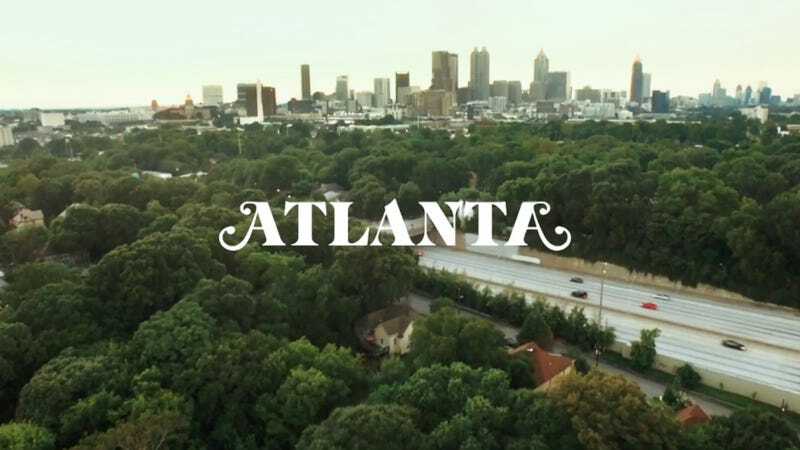 The first episode’s title sequence gives the viewer a bird’s-eye panorama of Atlanta’s landscape: highways, subdivisions with cul-de-sacs, and ranch houses surrounded by empty lawns. Other shows shoot street scenes in front of Manhattan or Brooklyn brownstones, but characters on Atlanta meet in barren parking lots and apartment-complex lawns — places where most young Americans actually hang out. It’s a work of fiction, but it’s a more honest portrayal of Atlanta than the one you’ll find on a “reality” show like The Real Housewives. For carless Atlantans, especially those in the suburbs, reality can be rough. Atlanta has the second-worst sprawl of any U.S. metro region, according to a 2014 study by Smart Growth America, just behind Hickory, North Carolina. It’s a region where the streets seem hostile to the idea that anybody walks. Atlanta has seen a surge in pedestrians getting run over by cars. Some victims simply could not afford to drive. In one 2010 case, a 30-year-old woman in the Atlanta suburb of Marietta crossed the street with her three children and was hit by a driver who had been drinking and popping pills. Her youngest child died, and the mother was convicted of vehicular manslaughter. Carless Atlantans complain that mass transit options are too infrequent, especially at off-peak hours, and that stops are too far apart, with schedules that make it difficult to transfer. “It’s very time-consuming and frustrating,” says Keambi Lane, 23, who lives in College Park, a town in southern Fulton County. To get to the north side of Atlanta, for instance, Lane has to take a bus to the train, then ride the train until he switches to another bus that takes him to his destination. Because Atlanta is so spread out, taking a cab is prohibitively expensive for anyone who can’t afford to drive. Scott’s organization surveyed how long it takes people to get from one spot to another in Atlanta without a car. “People were saying on average it takes them usually about two hours if they lived in outlying areas,” she says. Atlanta highlights an important but little-noticed transformation underway across the country: the suburbanization of poverty. Although the poverty rate is much higher in U.S. cities, there are now more impoverished Americans living in the suburbs than in urban or rural areas. As The Atlantic noted last year: Between 2000 and 2011, Atlanta’s suburban poor population grew by 159 percent, and 88 percent of Atlanta’s poor live in the suburbs. All that unplanned sprawl makes it hard for people to climb the economic ladder. Atlanta has the least social mobility of any major metro region in the United States, in part because of how hard it is for people in low-income neighborhoods to get to their jobs. And the congestion is legendary. In 2014, a few inches of snowfall snarled traffic for the better part of a week. Atlanta is what happens when a region grows without any coherent plan for affordably moving people around at all income levels. Atlanta lets us see what that means.